Born 1945 in Kota, Shail completed his M.A. 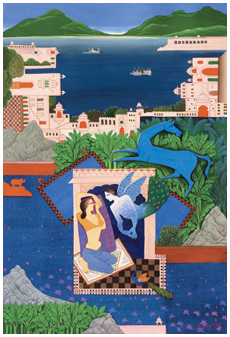 in Painting from University of Udaipur in 1969 and received a British Council Scholarship to study Printmaking at the Slade College of Art, London during 1975-76. He did his Ph.D. from Nathdwara School of Painting in 1980. In 1968 he attended a Fresco & Mural Course at Banasthali Vidyapeeth. He has participated in several solo and group shows in India and abroad including Hong Kong Visual Arts Centre in 2001; Malayasia in 2000; Sydney in 1997; Osaka in 1994 Spain in 1991 and 92; Paris and Japan in 1990; France Cuba & Latvia in 1989; Lisbon in 1985; U.S.A. in 1985; Netherlands in 1983; Japan in 1980, 1985 and 1990 and London in 1976. He has been honoured with several awards including Gold Medal in M.A. (Drawing & Painting); Rajasthan Lalit Kala Akademi Award for Printmaking in 1969; and for painting; All India Kalidas Samman, from M P in 1970; Bombay Art Society Award in 1971, 1973; Academy of Fine Arts, Calcutta Award in 1972, Rajasthan Lalit Kala Akademi award for Printmaking in 1976 and 1978; Bombay Art Society Award for Printmaking in 1977 and 1978; President of India Sh. 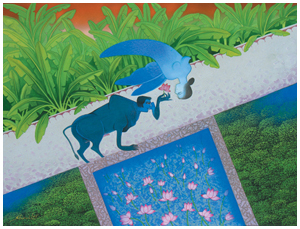 Neelam Sanjiva Reddy Award by AIFACS for painting in 1979; National Award by Lalit Kala Akademi, New Delhi in 1982; ADOGI Mini Print International Award for printmaking, Barcelona, Spain in 1991. He lives and works in Udaipur.